There are several different variations of acetaminophen and because of this the FDA (Food and Drug Administration) suggests that you as a parent carefully read the label of any liquid acetaminophen that you purchase for your child. Tylenol is the common brand name of acetaminophen. The former version of liquid Tylenol is slowly being phased out into a less concentrated version and this can cause a great deal of confusion for some parents, especially those who are unaware. If you don’t read the label carefully, you may accidentally give your child too much and cause serious side effects (including death) or give him too little which would make the medication ineffective. Because of the confusion, some manufacturers now only offer the less-concentrated version of this liquid medication. Despite this, both concentrations of Tylenol can be easily found and it is crucial to know which one you are purchasing. 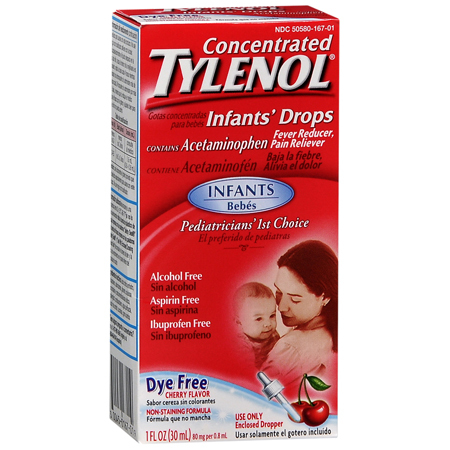 The FDA views this as a serious concern and cautions parents to be careful when dosing infant Tylenol in liquid form. Notes: All measurements listed (i.e. “teaspoons” or dropper) are indicated using the device provided with the medication). As mentioned earlier, always be very careful when giving your child infant Tylenol due to the variations in dosing quantities. Always carefully read the “Drug Facts” section of the packaging as this will not only tell you the concentration of the medication but also how to determine the correct dosage and how to use the medication. Keep in mind that even some medications that follow the old concentration of Tylenol (acetaminophen) will claim to be “new” and this simply means that the product itself is new or has been changed in some way. It in no way indicates the concentration or dosing of the medication which is why you should always read the package carefully. Why Is Overdose of Infant Tylenol a Risk and How to Deal with It? In April of 2011, the FDA’s Center for Drug Evaluation and Research made the discovery that the differing concentrations of Tylenol available for children and infants led to overdoses. These overdoses lead to serious illness and some deaths due to liver failure. Dosing provides a huge danger as a prescription of 5mL of the less concentrated version of the concentration that is read as 5mL of the more concentrated version may lead to an overdose which is potentially fatal. If the opposite occurs, the child may not heal due to a lack of medication. To ensure that you are using the correct liquid Tylenol, look at the Drug Facts label, specifically the section marked “Active Ingredient.” Packages that have a concentration of 160mg per 5mL are the less concentrated versions and are usually dosed with an oral syringe that is included. Packages with a concentration of 80mg per 0.8mL or 80mg per 1mL are the more concentrated version and usually include a dropper for dosing. Always check to see if the dosing instructions from your healthcare professional match those of the package and that the concentration is the same as well. If your child is under 2 years old, always ask his doctor for the correct dosing information. The easiest way to distinguish between the new and old forms of infant liquid acetaminophen is to examine the concentration and the mode of delivery. Old acetaminophen will be highly concentrated (either 80mg/0.8mL or 80mg/1mL) and usually come with a dropper. In some cases it will say “concentrated drops” but this is not always the case. The new acetaminophen, on the other hand, will be less concentrated (160mg/5mL) and usually comes with a syringe to use when dosing your child. 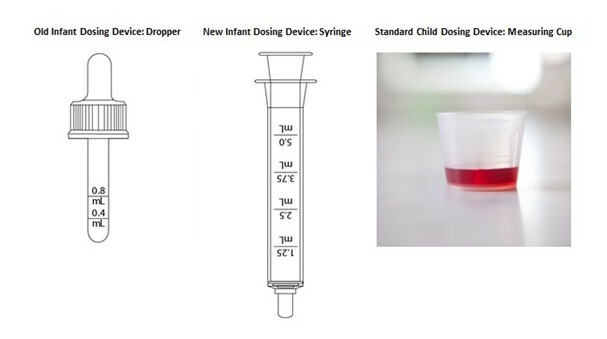 In addition to changes in infant acetaminophen, the packaging for liquid children’s acetaminophen has changed as well. Although it still has the same concentration (160mg/5mL), the measuring cups that are included in the old packaging may not use standard measurements while those in the newer versions will. To avoid confusion with this, always use the measuring device provided with the medication.